I'd like to create a Windows 8 bootable USB stick, but I don't have a Windows machine with me to do so. So how do I do it using Ubuntu? WinUSB is old, obsolete, and outdated. It can cause problems on newer systems. You should be using WineUSB or other software in place of WinUSB. This answer is, however, left here as-is for historical purposes. Create a bootable Windows USB (Vista and above) from Ubuntu through WinUSB software. installing WinUSB on EFI loaded Ubuntu will uninstall the grub-efi packages in order to install the grub-pc packages. It will make your system unbootable if you don't manually reinstall grub-efi package before rebooting. even other Linux distros as long as GParted and GRUB are installed. Using GParted, rewrite the USB drive's partition table as msdos, format it as NTFS, and then "Manage flags" and add the boot flag. In GParted, right click the USB partition and select Information. Copy the UUID somewhere as you will need it. 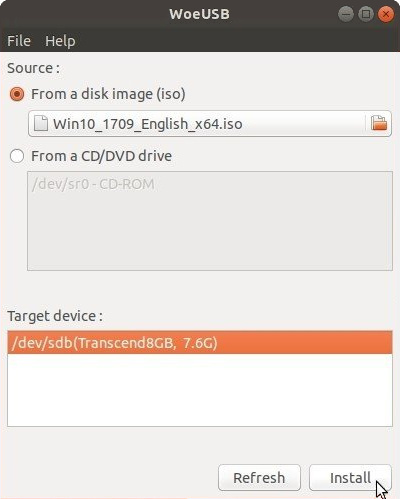 Mount your Windows ISO or DVD and copy all its files to the USB drive. Go to the USB drive, and if the folder named boot has uppercase characters, make them all lowercase by renaming it. Install GRUB on the USB drive. In the below command, replace /dev/sdX with the device (e.g. /dev/sdb, not /dev/sdb1) and replace <USB_mount_folder> with the folder where you mounted the USB drive (which could be like /media/<username>/<UUID>). Create a GRUB config file in the USB drive folder boot/grub/ with the name grub.cfg. Write this into the file, replacing <UUID_from_step_2> with the UUID you copied down in step 2. Now to use it, restart your PC, and boot from the USB drive. * Older Windows versions / editions may not be properly supported or not supported at all. I suggest reading the Microsoft UEFI Firmware page. 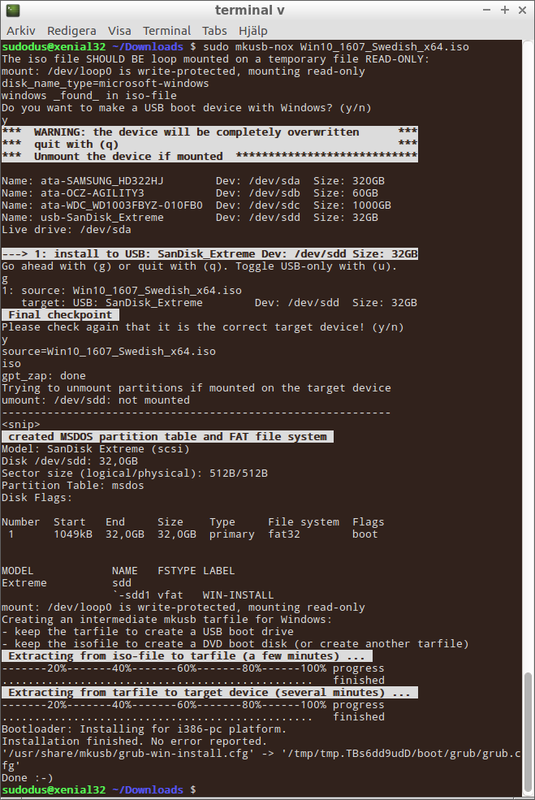 Using GParted rewrite the partition table of the USB drive as GPT. Create a new primary partition and format it as FAT32. Copy all Windows files (from mounted ISO or DVD) to the USB drive. Look on USB in the efi/boot/ folder. If there's a file bootx64.efi (bootia32.efi) then you're done. The USB is bootable. Skip to step 7. Otherwise, open sources/install.wim with the Archive Manager (you must have 7z installed) and browse to ./1/Windows/Boot/EFI/. From here extract bootmgfw.efi somewhere, rename it to bootx64.efi (or bootia32.efi for supported 32 bits OS [?]) and put it on USB in efi/boot/ folder. If you're making a Windows 7 USB, copy the boot folder from efi/microsoft/ to efi folder. Don't forget to unmount (safely remove) the USB drive. Select the proper EFI loader from your BIOS. Source: My blog post about this can be found at Make a bootable Windows USB from Linux. When properly used with a compatible target operating system, both of these methods should get you a bootable USB drive. However this does not guarantee successful installation of Windows. WinUSB is a tool for creating a bootable USB flash drive used for installing Windows. Native UEFI booting is supported for Windows 7 and later images. WoeUSB is an updated fork of the WinUSB project. Some third-party installers feature Windows installation images (/sources/install.wim) greater than 4GB making FAT32 as target filesystem impossible. NTFS filesystem support has been added to WoeUSB 3.0.0 and later. This will install the WinUSB graphical interface and the WinUSB command line tool. WinUSB and WoeUSB support both UEFI and BIOS for FAT32/NTFS/ExFAT USB flash drives. 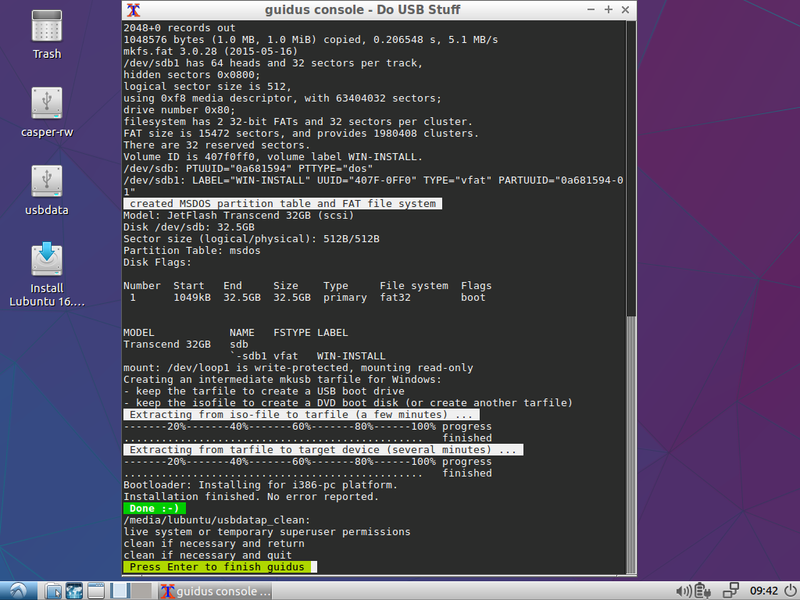 The WinUSB GUI is much easier to use than the WinUSB command line tool. 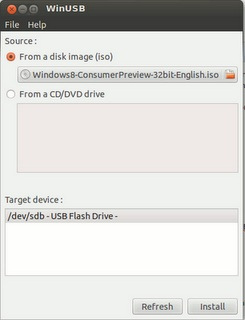 To install a Windows ISO on NTFS partition and edit the Master Boot Record (MBR) of the device using the WinUSB and WoeUSB command line tool run the following command:Click the radio button to the left of where it says From a disk image (iso), browse to the location of the Windows .iso file, under Target device select a USB flash drive, open Disks application and check that the Device name in Disks matches the Target device in WinUSB (it should be something like /dev/sdX where X is a letter of the alphabet), and click the Install button to install to create a bootable Windows installation media on the USB flash drive. This requires that your motherboard is able to boot from CDROM-USB. Internet access to install all the above, the Windows ISO image and a USB stick with more than 4GB. Now look for gparted in the Dash or type gparted in the terminal. Select your USB stick from the right dropdown list. In my case it's /dev/sdg, yours may be different. Remove all partitions and create a single big FAT32 partition with Gparted. Once that is done, unplug and plug your USB stick so it gets mounted (you can also mount it from the same GParted), now execute Unetbootin, again, you can look in the dash or typing in the terminal. Select that you want to use an iso, look for the path your ISO is. Mark the checkbox to see all devices, here you have to select the very same device you selected in Gparted, otherwise your data can be lost. Select continue. Wait for a moment and done. Restart your pc and select to boot from the USB. Some answers are outdated, since WinUSB is not working anymore. But there is a working fork called WoeUSB. It does not uninstall grub-efi anymore! In Non-UEFI machines, we can use GRUB2 to make USB stick bootable. Then, we can use 'ntldr' command in the GRUB2 to boot Windows from USB. Enable the boot flag on the target partition of the USB drive. It can be easily done with the use of the tool called "GParted". It is a GUI tool for drive partitioning. If the installation image is an ISO file, mount it and access the files. Copy all the files to root of USB drive. It seems difficult to find a linux tool that can create boot drives (USB sticks, memory cards ...) with Windows, so I added this feature to mkusb-nox and later on created mkusb version 12 with this feature. It works in all current versions of Ubuntu (and Ubuntu flavours: Kubuntu, Lubuntu ... Xubuntu) and with Debian Jessie. The created boot drive can boot 64-bit Windows in both UEFI and BIOS mode. mkusb-nox can create a USB boot stick with Windows 7 - 10, but you have to cope with a command line interface. A new improved version, mkusb 12.2.9, is available now via the standard (and stable) PPA. It can install for BIOS mode also from installed systems running in UEFI mode. Some minor but irritating bugs are squashed. A rather simple 'Do it yourself' method is described at the following links, and it has the same capabilities to create Windows install drives as mkusb. If you don't like PPAs or if you want to 'Do it yourself' and understand the details, this method is for you. winusb from the accepted answer is the only easy method I found. However, there is no winusb package for saucy. You can however install the raring package by downloading it here and opening it with the software installer. It works with saucy. You can use WinUSB for that to install WinUSB on your Ubuntu follow these instruction. WinUSB comes with a simple GUI with minimal options to go with, here is how to use WinUSB to make bootable Windows USB from Ubuntu. You can use any Windows ISO may be for XP, Windows 7, Windows 8, Windows 8.1 or any other. Instead of /dev/sdb use your path do the flash drive . Write the img file to disk. Using this exact block size is important. Not the answer you're looking for? Browse other questions tagged windows usb-creator or ask your own question. How to burn a Windows .iso to a USB device? 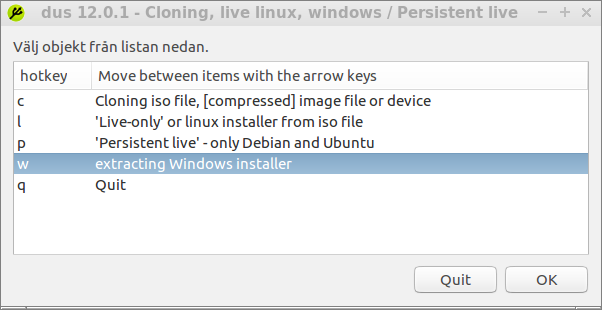 How to create a Windows installation USB in Ubuntu? How do I create an bootable win 7 usb in ubuntu? What to do to install Ubuntu with a Bootable USB Stick? How to create a Windows Bootable USB? Create OpenSUSE bootable USB stick from Ubuntu?